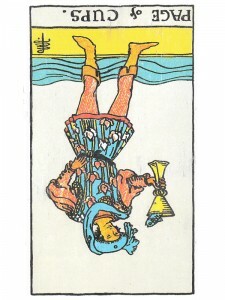 Page of Cups (R) says following an “inclination” – acting without thinking or allowing your immediate desires to seduce you, particularly if they go against your common sense – like making a promise you can not keep or a commitment that does not mean anything to you, can lead to making mistakes. Avoid being over powered by disturbing visions. The sudden emergence of psychic talent, even if deliberately sought through training – can “appear” very frightening. These visions only mirror your fear – reminding you to remain calm and grounded to reality. Trust and believe that the obstacles in your life will soon be removed and you will see things in a new light. Make a conscious choice to believe that things are changing. You always respond emotionally to the receipt of any information. If you wish to control your situations, you need only prepare yourself for this emotional response. Always seek that which is loving and realistic. You abandon your own feelings when you allow yourself to repeat old patterns. Fully experience your feelings – become emotionally vulnerable. Emotionally “let go” and allow yourself to love deeply – this will release your fears of abandonment and loss. Are you repressing your feelings? In the first position: What you observe in this fashion and what you learn about the art of learning, will benefit many others as much or more than yourself. In the fifth position: You may think adversely about this Page of he/she about you.